The Journal of Prosthodontics has been the official publication of the American College of Prosthodontics for more than 20 years. In excess of 1,000 peer-reviewed articles on a wide variety of subjects are now in print, representing a treasure chest of history and valuable information on a myriad of topics of interest to the specialty of prosthodontics. 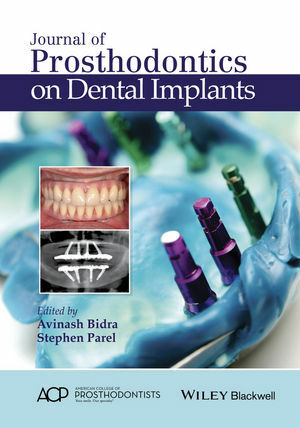 Journal of Prosthodontics on Dental Implants is a “best of” compilation of the journal’s articles from a number of years, focusing exclusively on the multiple applications of osseointegrated implants: for the management of the partially edentulous patient, management of the completely edentulous patient, and management of patients with maxillofacial defects. Sections also relate to in-vitro studies and general considerations to round out the readership selections. Whether you’re a subscriber who’s looking for implant articles in one convenient collection or a clinician with a focus on implant dentistry looking to improve your knowledge base, Journal of Prosthodontics on Dental Implants is a must-have for your personal library. Avinash S. Bidra, BDS, MS, FACP, is a maxillofacial prosthodontist and Program Director, Post-Graduate Prosthodontics, Department of Reconstructive Sciences at University of Connecticut Health Center. Stephen M. Parel, DDS, FACP, is a maxillofacial prosthodontist in private practice in Dallas and recipient of the 2015 Nobel Biocare Brånemark Osseointegration Award.